My name is Alexander McKay QX17636, 16 Platoon, “D” Company, 2/26th Battalion, 8th Division A.I.F. 1940 – 1943. My family called me Alick, and I was known in the Army by the nickname of Mike. I shall start off by describing my start in life: I was born on 13th December 1905 to a mix of Irish and Scottish descent, my father being Irish and my mother Scot. I had one brother and two sisters all younger than me. My parents decided to immigrate from Ireland to Australia - arriving aboard the ‘S. 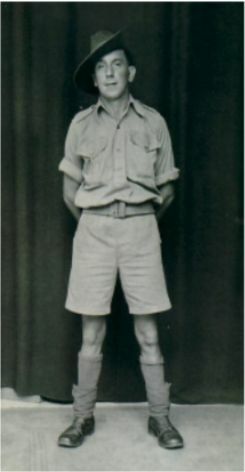 S. Demosthenes in January 1923 for the sum of 165 pounds. ($330.00) So I became an Aussie. I started work with the water board, later to be incorporated in the Brisbane City Council. After a few years of being a gay blade, I met and married a lovely Aussie girl. She made me change my ways. Anyway we were blessed with four boys before the war started. We lost the eldest boy at about three years old in 1934 to a germ present in cows milk (pasteurisation had not been in at that time). The next boy was born in 1935 and then twins in 1937. Life was not good to us in the 1930’s and at the start of the war there was not much work around. I tried a few things and being a labourer I finished up working on the rail link from Ipswich to Boonah. I joined up in July 1940 with the 3rd Training Battalion, then to be inducted into the 2/26th Battalion A.I.F. at Grovely. Together with the rest of the Battalion I trained at Grovely, Redbank and Bathurst before moving off to Singapore aboard the Marnix Van Sint Aldegonde in July 1941, landing in Singapore on 15th August 1941. From Singapore I sent home some photos and a colour book about Jahore and their Sultans and Princes and life as it happened. During the fighting of the Malayan Campaign, I fought a good fight, and after capitulation on 15th February 1942 became a Prisoner of War. I left Changi in April 1943 a member of Pond’s Party, which in turn was part of “F” Force. I did not survive the Japanese brutality and uncompromising reality of what a human being can do when pushed to the limits. I succumbed to their methods on 14th September 1943 at Chungkai in Thailand and was buried there. At a later date like many other Aussies, I was reburied at Kamburi War Cemetery, now called Kanchanaburi War Cemetery. So to all who may read my story, I wish you all the best, and to my mates of war, thanks for knowing you.